Michelle Lee coming over the barriers at West Chester Cross in October. Photo by Bill White. Participation and interest in Cyclocross racing has grown dramatically in this country in recent years. 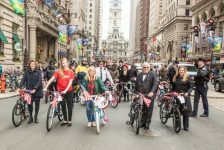 With Singlespeed Cyclocross World Championships (SSCXWC) coming to Philadelphia in December, we thought it was time to find out a bit more about the cyclocross community in the region. Michelle Lee, local racer, cyclocross organizer, and the PHLCX Facebook group administrator got us up to speed. What is cyclocross, and what is responsible for its recent growth in popularity? Cyclocross (or cross, or CX) is a form of bike racing. Races last 30 to 60 minutes, with laps around a 1.5 to 2-mile mixed course of grass, dirt, gravel, and pavement. In the last 5 years, participation in cyclocross in the US jumped from 32,000 to 80,000. My guess is that CX has a great atmosphere and offers something for everyone. For people who’ve never raced before, it’s a great place to start  the courses are designed so that even if you’re not in contention for a top placing, you find someone nearby to battle with or challenge yourself to ride a section smoother and faster. For people who race other disciplines, it’s a nice change of pace after a long summer season. I realized that the races I enjoy so much are run on 99% volunteer power, so in addition to getting better at racing I tried to help where I could. Please give a little background on yourself and what your role is in the Philly cyclocross community. Cyclocross practices where anyone can attend and learn to race for free have been running for at least 15 years, led by Kelly Cline, Dave Lowe, Mike Yozell, and many more. As they moved away or picked up more family commitments, my Bicycle Therapy / Melitta teammates took this on. We are just the latest in a long chain! In 2008 I was living in New York and looking for excuses to get out of the concrete jungle, so I started racing bikes. A lot of races were in the Philly area, so I’ve been bumping elbows with a lot of the same friendly faces for a long time now. I spent last year bouncing to and from San Francisco for work, so I only really moved to Philly about a year ago. You’re interviewing a carpetbagger. Eventually I realized that the races I enjoy so much are run on 99% volunteer power, so in addition to getting better at racing I tried to help where I could. A big project was getting the Mid Atlantic Cyclocross series to adopt equal pay for elite women racers, making it one of the first race series in the country to do so. Chamounix cyclocross practice. Photo by Michelle Lee. Like I mentioned, practices have been going on for over a decade, mostly on the Plateau. I don’t know the exact details, but it could have been a confluence of the practice becoming more popular and more heavily used, and maybe park staff increasing their oversight. In any case, after 2011, the practice leaders at the time were asked to stop holding practice on the Plateau. A group of us decided to take a constructive approach, going to Parks – Rec and try to find an alternative to hold practice, teach newcomers, and enjoy the park. In July we started partnering with the Belmont Plateau Trails Alliance. They’ve worked with Parks – Rec for over 3 years to steward the mountain bike trails on the Plateau, and that existing relationship was key to helping us move forward with PPR. On such short notice, the best space we could agree on was the field near Chaumonix Drive. The agreement was that we reroute the course each week to avoid visible wear and tear. We held one volunteer workday to prep the course, and held our inaugural practice the first week of September. How did PHLCX get started? Is PHLCX a name created to define the Facebook group or is there another official organization? PHLCX is the Facebook group at this point, with over 400 members at last count. We overlap a ton with the formal organizations that already exist: the Mid Atlantic Cycloross and PA Cyclocross race series, as well as the state governing body and local clubs and teams. If we need another legal entity at some point to meet our goals, we’ll make it happen. Cyclists stop pedaling for a moment during a cornering skills clinic by Take Aim Cycling’s Harlan Price. Photo by Michelle Lee. Cyclocross practice is 6:30 Wednesday evenings from August to October. We do drills to work on skills such as starts, cornering, and barriers, and a couple of short practice races for fitness. Practice is open to anyone, and up to 45 people show up, from kids to masters racers. Cyclocross bikes are ideal, but a mountain bike will also work. This year’s CX practices ended with Daylight Savings time, but anyone who’s interested in upcoming races or next year’s practice should join the PHLCX Facebook group. How receptive has Parks – Rec been to your project? What has been your hardest challenge? What has been easy? What’s your dream for this project? The easy part is how much people have pitched in to make cross practice a reality this year, despite the challenges. Each practice requires more work now, because we’re setting up and breaking down the course every week. We drag a 20-pound backpack of cones across the city. Someone brings a set of PVC tubes to build practice barriers. It’s even more of a community effort than before. Our goal for this fall’s practices was to run great practices and also demonstrate that CXers can be responsible park users. To be clear, we don’t yet have a dedicated cyclocross course, but that’s the long-term vision. See, the elements that make a course great for cyclocross (natural surfaces, moderate grades, and open design with lots of visibility) also make it a fun, widely-accessible place to bike, run, or walk. It fits the mold of what the International Mountain Bicycling Association (IMBA) calls Gateway Trails and I’d love to see one established in Fairmount Park. It could be a huge local asset, and not just for cyclocrossers. Cities like Boulder and Louisville have seen economic development from their dedicated cyclocross courses, from weekly race series to bringing 10,000 visitors for the World Championships. What gear do you use to go up Parachute Hill? Parachute Hill’s surface is constantly changing: getting rutted out by heavy rains and refilled, so gearing changes with the surface. Usually I’ll use a notch or two above my lowest gear so as not to lose traction. 36-23 or so. How do you feel about the recent popularity of disc brakes on cyclocross bikes? Have you made the transition, or are you sticking with rim brakes? Have you seen my cyclocross setup?! For years I was racing a thirdhand Frankenbike so I’m focusing on basics first. Dan Langlois at Bicycle Therapy just helped me get set up on a beautiful new Specialized Crux frame. The drivetrain is snappy but handling is very forgiving on rough terrain, which is great for a roadie like me. I had the chance to test ride hydraulic discs last month; they’re amazing. But to me they weren’t $2,000 worth of amazing, which is what new shifters, brakes, and wheels would cost, so I’m still on cantilevers. I love how tightly knit the ‘cross community is: how it brings road and mountain bike racers to battle on middle ground. What do you love most about cyclocross? What other bikes do you have, and what other type of riding do you do? I love how tightly knit the cross community is: how it brings road and mountain bike racers to battle on middle ground, how fun it is to watch because course layouts let you watch most of the race unfold from one spot. And I kind of love that the courses are always a little bit weird and keep you on your toes. I also race on the road and track; I love tactical sprinting. City dwellers have an advantage: Every red light is chance to practice a standing start. Occasionally my ladyshredder teammates talk me into a mountain bike event. Our South Philly basement is crammed with a bike for each of those, plus an old-school Cinelli with arc bars to get around town. Are you riding or spectating in SSCXWC at Belmont Plateau in December? You’ll have to come spectate to find out! 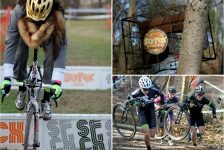 What makes Philly  and Belmont / West Fairmount Park  unique in the cyclocross world? Philly is more or less the epicenter of two great race series (Mid Atlantic Cyclocross and PACX) so there’s a race within a 90 minute drive almost every weekend from September through December. It’s a stunning place to ride on any type of bike. Because so much of the city was built before the age of the automobile, and Fairmount Park is a wonderful lifeline, you can ride three hours of mountain bike trails or through quiet country roads and still get to work by 9am.